Mansion Poker (www.MansionPoker.com) launched in 2004 as an independent poker room. Although Mansion Poker quickly became a permanent fixture in the poker landscape, initial growth was slow. 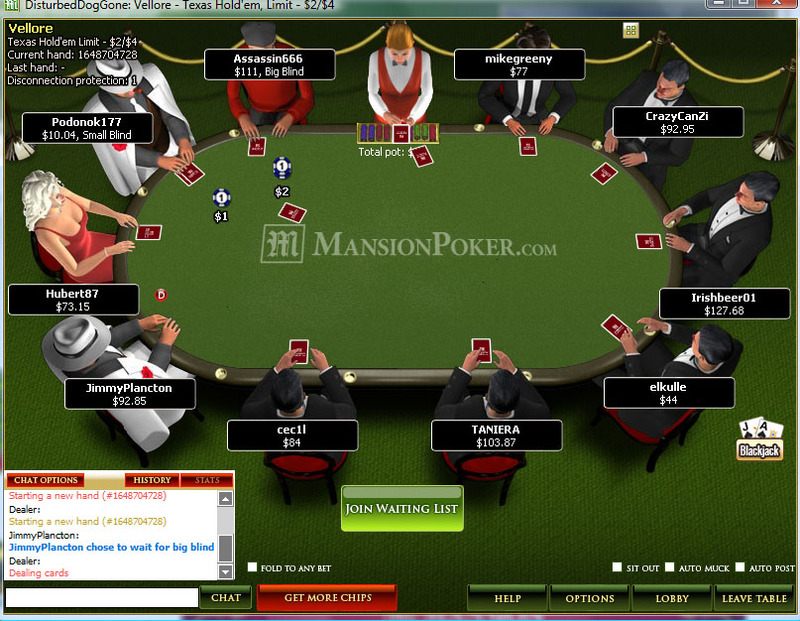 In 2007, management decided to move Mansion to the ever-popular iPoker Network. This resulted in an immediate traffic boost, which made it easier than ever for Mansion Poker to acquire new players and offer better benefits to existing members. Mansion Poker is one of the premier poker rooms on the iPoker network, which is the largest non-USA poker network in the world. Along with Titan Poker, Mansion offers tons of NL Hold'em cash games, sit and gos, and tournaments, along with limited PL Omaha cash game traffic. Plus, Mansion is currently running a special promotion for all BestPokerSites.org visitors - sign up with bonus code BPSORG, and automatically receive a 100% up to $500 bonus on your first deposit (details later). Mansion Poker does not currently accept players from the United States, but the poker site has become a popular room for European players (see a list of USA poker sites). The iPoker Network has experienced significant growth in recent years and now resides as one of the largest non-US poker networks. New players are welcomed to Mansion Poker with a 100% bonus for up to $500 on their first deposit at the site. To claim this bonus, use any link on this page to visit Mansion Poker and use the bonus code BPSORG to claim your bonus. This Mansion Poker bonus is offered to all first time depositors at Mansion Poker. Ring Games: Points are given out based on the rake taken out of each hand. This can range from 0.3 points per hand to 21 points per hand. Tournaments: Points are earned at a rate of 20 points per $1.00 paid in tournament entry fees. The Mansion Poker software comes with all the standard poker room options. Players can use the poker lobby to navigate, sort and filter tables with ease. Up to sixteen tables can be played at a time, so multi-tablers will have no problem getting their poker on in bulk at Mansion Poker. As a member of the iPoker Network, Mansion Poker has a large player base and the ability to host dozens of tournaments every day. The tournaments range in size from small single table tournaments to large, high stakes tournaments with six figure prize pools. Players can log in any time and find plenty of tournaments to choose from. The largest tournament at Mansion Poker is its weekly $200,000 Guarantee on Sundays. They also host a variety of events that send players to large live tournaments such as the Asian Poker Tour, Irish Winter Festival and so on. Sit n go tournament players will be pleased to know that Mansion Poker offers a strong SNG experience as well. In addition to a large variety of cash SNGs, Mansion Poker also offers jackpot SNGs in which players can win their way up through the levels and compete for a $50,000 prize at the top level. Mansion Poker has a large player base thanks to its affiliation with the iPoker Network. Several poker rooms are members of the iPoker Network and they all share the same tables and game offerings. This makes it possible for every site on the network to offer its players a large player base and 24/7 action. At the time of this writing, there were more than 15,000 players seated at nearly 3,000 poker tables. Player levels go up and down from there, but you can always expect to find action at all but the highest of stakes. There might be larger poker sites out there, but Mansion Poker is definitely no pipsqueak. The player support at Mansion Poker is outstanding. Most poker sites get low reviews in this area, but Mansion Poker has impressed us with its variety of contact methods and fast response times. They offer 24/7 phone support and have set up toll-free phone numbers in seven different countries, plus an international support phone number. If you don’t need to talk to the support team by phone, you can also send them an e-mail or fax. The Mansion Poker website also has a basic FAQ that players can use to answer their questions quickly. The FAQ isn’t incredibly detailed, however, so you might want to just call or e-mail them for quick answers to your questions. Ready to Play? Visit Mansion Poker to Get Started Now! Now that you know everything there is to know about MansionPoker.com's poker room, it's time to get started. Visit Mansion Poker and use bonus code BPSORG automatically receive our exclusive 100% up to $500 sign up bonus.